Yesterday I met with Sandy, the project leader and my primary customer. A couple of weeks ago I gave her a couple of pages of recommendations, along with an A3 describing how I thought I could support the team. We use a model from the Lean Learning Center folks. Below is the LLC model and a rough idea of the A3 I did to facilitate my discussion with Sandy. I needed her to validate my thinking. Task force leader has requested lean consulting support. Task force's work is more successful because of lean. Everyone learns more about journals, markets & lean. Correct tools/thinking provided in response to customer (task force) pull. Help Ellen use VSM for journals process current state. I also did an A3 for the project, based on a document Sandy wrote to establish the need and plan for the project. It had been validated by Mark and the task force chair, Peter. Somehow, as Sandy and I talked, the idea of Hoshin planning – policy deployment – was percolating in my mind. I started drawing a set of rectangles – one for the executive level that stated the need for our project, one for the task force, and one for the staff process redesign team. The rectangles were linked – the task force line item on the executive A3 becoming the business case objective on the task force A3. I don’t think classical Hoshin planning uses A3s for deployment, but what the heck? We’re learning by doing, and we can get better at using tools as we go. Sandy took the project A3 and went about constructing an executive A3 based on our current strategic planning documents. A3s are for walking around and showing to people, so Sandy showed it to Ellen and incorporated her ideas. Sandy then showed Mark what she had put together and he liked the idea. Seeing the linked plans, Mark was able to clarify the executive A3 as understood by Sandy, which is exactly what Hoshin planning is supposed to do. In this case, literally get the team members on the same page. Sandy is more confident in the team’s ability to know what it is supposed to do once we get the other team members familiar with the A3 tool. I cobbled up a short primer on A3 problem solving that can go to the team members along with their advance meeting info. 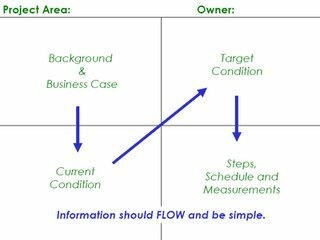 Luckily, Cindy Jimmerson of Lean Healthcare West, agreed to do an article on A3s for the March “Lean Directions” and I had some materials from the Lean Learning Center. I grafted them to each other for a quickie introduction to the A3 process. Sandy is super-organized and is determined to e-mail the members their meeting materials Wednesday (Feb 9) for our meeting in Chicago on Monday. The schedule is more compressed that she would like, but our chair wanted an early face-to-face meeting to kick off the project. Next – value-stream mapping the process for getting articles written and ready to publish in a scholarly journal. And pretty soon, reflections on integrating thoughts from Joe Ely and Hal Macomber on lean project organization. Question: This is a pretty inexact use of Hoshin planning, but others I’ve seen are too complex. Do you know of a “learner’s permit” type of process that would be better than using the A3? Karen, I think you are doing fine. Hoshin is "policy deployment", it is setting direction and then moving towards it. Your use of A3s allows execs to see what policy is, in reality, being deployed. Mark's review of it and tweaking thereof demonstrates the value. It also pulls in a key principle of project management; keeping the objective in front of the team. The simplicity of the A3 is central. Tools are simply tools. More important is the underlying communication and agreement. You are getting that done. That's enough. A VSM on writing articles...very cool. I'm guessing you'll find looooooooooong wait times as manuscripts sit on desks, awaiting reviews. How do you speed that up?? Will be a good question!! We've identified some serious weak points in the review process - and they all boil down to people - their commitment to the journal, primarily.